What every sprinter should understand! Every athlete wants to be faster. What most don’t realize is that to get faster you must get better at slowing down. No this isn’t some yogic, metaphysical, “get in the zone” nonsense. This is about one of the most overlooked neuromechanical facets of sprint speed. You see, while most correctly associate sprint speed with horizontal movement, the reality is that in human locomotion, an athlete’s ability to run fast is underpinned by their ability to stop themselves moving vertically downward. While we see the positive movement of the athlete in the upward and forward direction, this isn’t possible without first stopping the downward movement of the athlete’s center of mass that begins immediately following the apex of each flight phase. After the athlete’s center of mass reaches its apex when in the flight phase, the center of mass begins to accelerate back down to the ground thanks to gravity. Recall from high school physics that this acceleration back down to the ground is occurring at 9.8m/s2. This acceleration is largely what accounts for the massive ground reaction forces that athletes experience at touchdown. And if an athlete doesn’t apply a force to stop themselves they’ll continue to move in the downward direction. This point is key because the ability to apply insane forces in the correct direction and do so over ridiculously short periods of time is a trademark characteristic of the fastest people on earth. So for those of us who are working to make people faster….how do we develop the qualities necessary to better battle gravity? We must improve our capacity to slow ourselves down…in the downward direction. Before we get in to the practical part of this discussion (which you’ll have to share to unlock), it is beneficial to review some of the kinematic and kinetic characteristics of ground contact for an elite sprinter because it will provide useful insight on how they are able to run as fast as they do. And by looking at the tip of the human iceberg we’re able to gain insight on what mere mortals can do to improve their speed. An initial spike in the vertical force upon impact. This spike is far in excess of what is observed in lesser runners or what is predicted by traditional spring-mass models. See the photo from Dr. Weyand & Clark’s most recent research. Minimized backside mechanics where the support leg makes a short ‘stroke’ of the ground with respect to the hip. From a movement standpoint, we should see minimal hyperextension of the hip and optimized extension of the hip and ankle. Less downward vertical displacement of their center of mass immediately following touchdown than their lesser peers. Extremely short ground contact times. 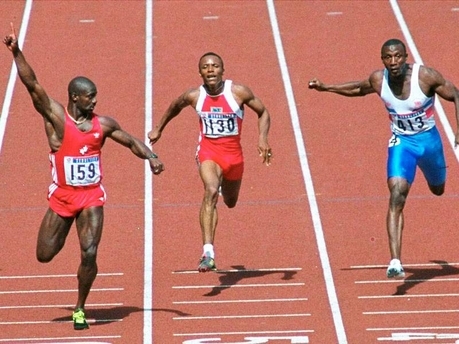 The top male sprinters in the world are on and off the ground in less than 0.09 seconds when sprinting at top end speed. The top females take just slightly longer. As with most things in running, both mechanics and physical capacities play a role in making this possible. From a mechanical standpoint, the swing phase should be active in to the ground with the position of the ankle, knee and hip joints and the location of the touchdown optimized to best apply the forces with the desired vector. From a physical capacity standpoint, the athlete must have the fast eccentric force generating capacity to ensure that the ‘spring’ has as little ‘give’ as possible at touchdown. It would be overly simplistic to think these two elements are not closely interdependent (optimum mechanics helps pre-load the spring) but for the purpose of this post let’s focus on the physical qualities that allow top athletes to do what they do and how we might train those qualities.